I’m a big fan of match-three games. One of the two games I bought on my old Nokia flip phone years ago was Bejeweled (the other was Critter Crunch, and I miss it dearly). It was very basic, but I mostly played it on my subway commutes. It was an easy game to play one-handed while standing on a shaky train. Today with smartphones, we have many more options besides Bejeweled. Birzzle Pandora is still one of my favorite match-threes to play on a train. More recently, Threes! has consumed that time, but I still pull out Birzzle Pandora here and there. While we have more options these days, free-to-play games filled with in-app-purchases (IAP) are what dominate the market, and I don’t have much patience for those shenanigans. Super Glyph Plus is an IAP-free premium one that I highly recommend, and Hero Emblems would be another. While it’s not as commute-friendly as Bejeweled or Birzzle Pandora, it’s loads of fun as long as you don’t mind it consuming a lot of your time. I’ve already invested over twenty hours into the game, and based on the world map, I think I’m close to two thirds through. Granted, I’ve been grinding quite a bit and replaying dungeons in which I missed out on the treasures. But even if you manage to get through with less grinding than I did, the dungeons will each take you some time to complete. You don’t really play this game for five or ten minutes at a time. This is all to be expected, I suppose, since the game is more of an RPG with match-three elements than a match-three with RPG elements. There are no high scores to beat or an endless mode (although I would love to see an endless arena added). You’re progressing through the story and strengthening your team. You simply do so by creating chains of emblems. As with most match-three games, you swap emblems to create chains of three or more. A simple chain of three won’t do much. 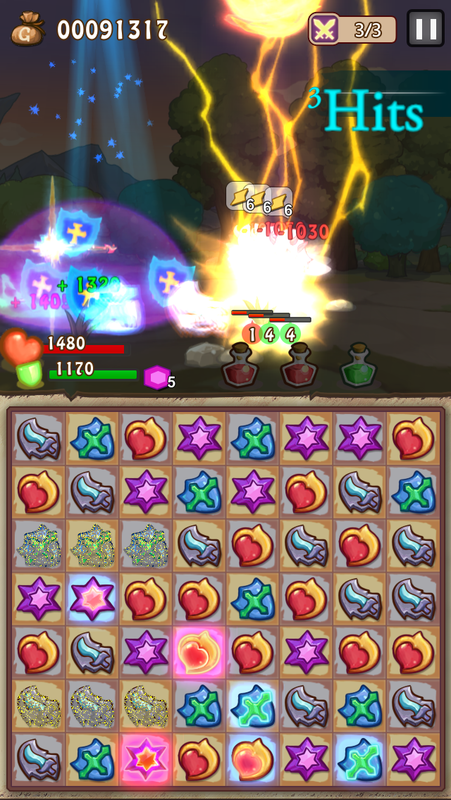 You need to plan out your moves and try to get chains of four or more, which will create more powerful emblems. Obviously, some luck is involved, but it requires real strategy to plan out your moves and not waste anything, including your turns. 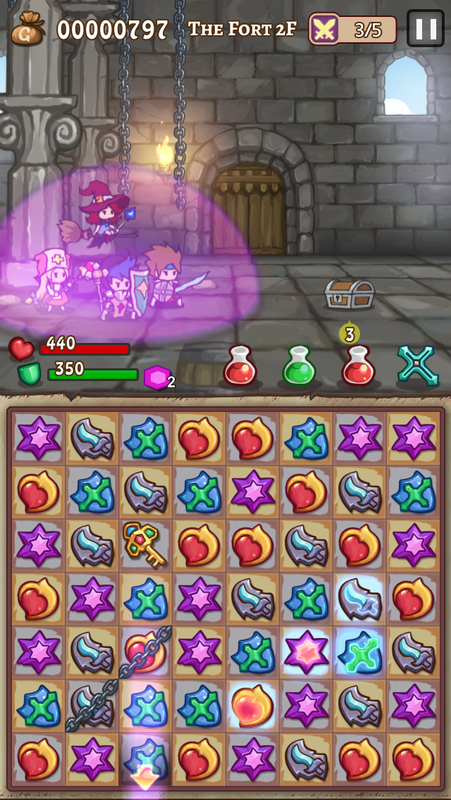 The game is turn-based, so you can take as much time as you need to think about your next move. 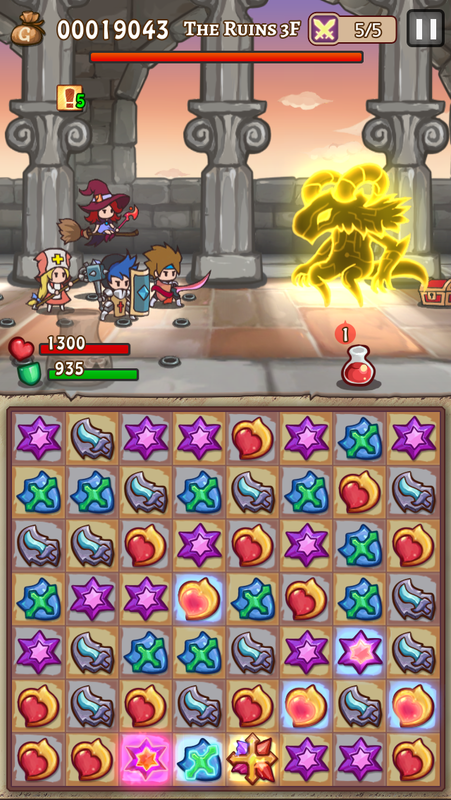 Your party consists of four heroes, each representing a specific emblem. You have your typical warrior who deals heavy damage and your knight who both defends and does less damage. There is also a mage who does magical damage and a priestess who heals and removes negative statuses. Each one has emblems that can be upgraded, which act as equipment that increase their stats. They also each have a variety of skills that they can equip, but you have to choose which ones you want to use for a specific dungeon. 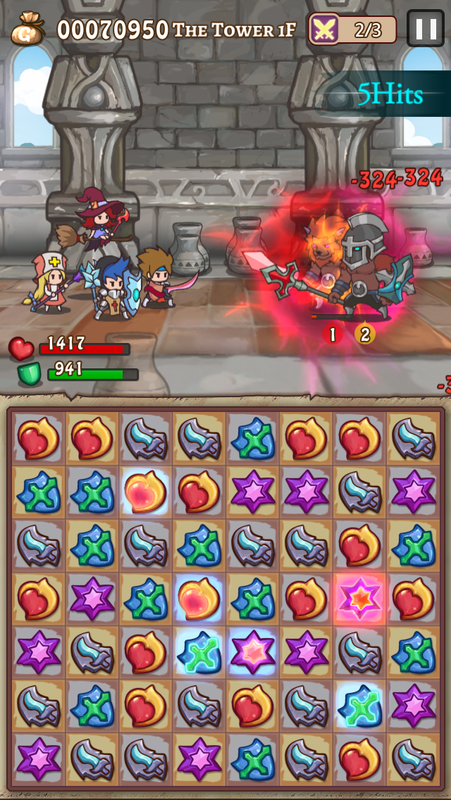 This is also part of the strategy, because if you equip three fire skills and encounter a boss that’s immune to fire, you won’t stand much of a chance. The map is fairly large, and your party moves around like a piece around a board game. There are random encounters which help with grinding, but the meat of the game is the dungeons. The game lets you know where to go next with a little exclamation point over an area. If you head there, you’ll enter a dungeon that involves several rounds of enemies followed by a big bad boss. There’s no warning when the boss is coming, and if you die, you have to start the whole dungeon from the beginning. You don’t get to keep anything you looted. It’s like you were never even there. While this can get frustrating and time consuming, there is the small benefit that any items used in the failed battle are returned to you. So if you’re about to die in a dungeon, it makes sense to use whatever items you have on you to try to survive. You won’t have to go back to the shop to buy more if you die. Once you start encountering enemies that can poison, burn, freeze, or lock emblems, things really heat up. 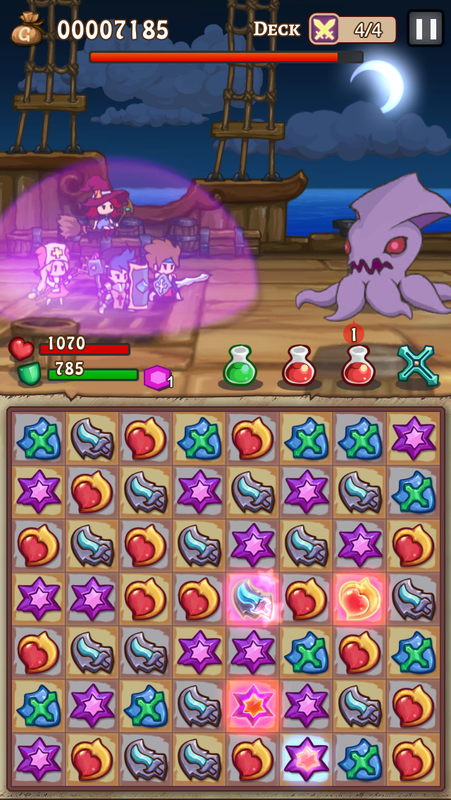 To get rid of those statuses, you need to use the healer’s skills or match them to remove them from the board. If you don’t do it fast enough, they can multiply and put an end to you pretty quickly. There are a few little touches that really make the game feel like a work of love. There are treasure chests in dungeons that, if opened, will provide you with emblem upgrades and skills so you don’t need to grind for gold as much. The catch is, in order to open it, you need to make the key drop to the bottom in a certain number of turns. If you don’t, it will disappear. You can revisit the dungeon as many times as you want, though, to try and get it. Getting the treasures offers its own challenge, and later on in the game you’ll have no choice but to get your upgrades from those chests, as there doesn’t seem to be a shop yet that sells certain emblems. 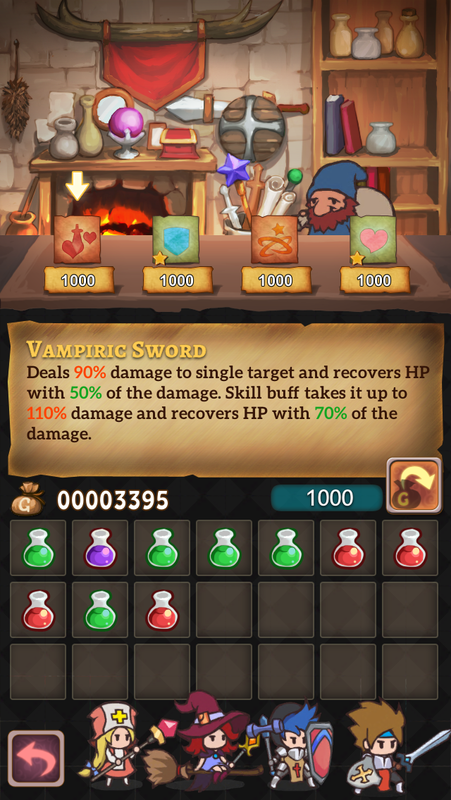 Some skills also appear to be only available through chests. *Edit: After investing another 15+ hours into the game, my only real gripe is that there’s no way to tell which skill/emblem loot you missed other than playing all the dungeons over until you know you’ve exhausted them, or someone else tells you they found something there. I would love to see a system put in place that tells you what you missed, just a small marker like a star. This would make a huge difference. 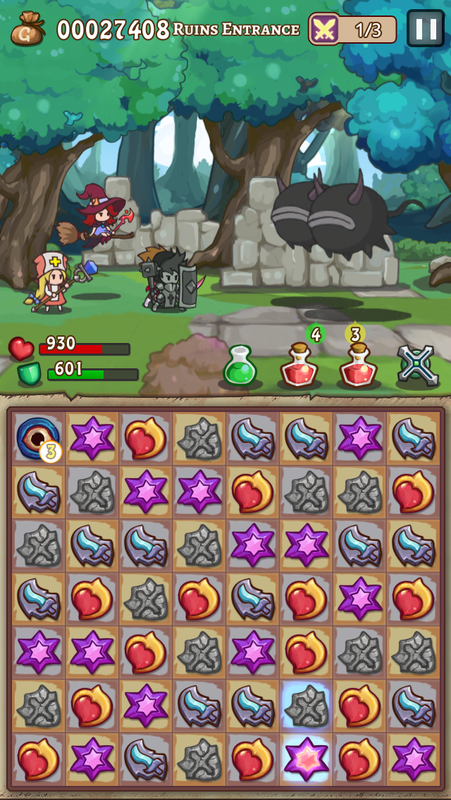 The game can be quite brutal at times, especially later in the game when bosses are often immune to all regular attacks. I’ve had several battles where I was surprised that I even won, because I came so close to dying multiple times. This aspect of the game is what makes it both frustrating and addictive at the same time. Every time I lose, I want to go back and try again, hoping that the next time will be different. It could take fifteen tries before you defeat a boss! Take this hornet, for example. I finally defeated him, but it took a lot of attempts. I’m also working on a guide for the game, which you can see here.